An authentic high-design contemporary dining chair with sensual curvy details and molded ply seat in wood or padded upholstery. It is very comfortable and very inviting! The Strada contemporary dining chair has many sensual organic curves that compliment each other to make an elegant and beautiful dining chair that is both comfortable and inviting to the eye. The seat shell is reclined to make comfortable sitting and the arched arm supports the elbow and arms just right. This contemporary dining chair is trully a remarkable design and extremely well built by Bernhardt design. 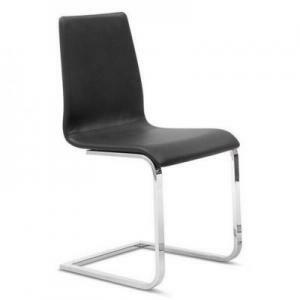 The Strada contemporary dining chair has matte chrome legs and a molded Beechwood ply shell. It can stack 5 high or 8 high when used with a stacking cart. It can have a fully padded and upholstered seat shell in various textiles and leathers. The wood shell can have various wood stains from light to dark. Available in all finishes. When specifying light finishes 836, 837, 840, or 850 the natural characteristics of the wood will be visible. Please call us for options, samples, and ordering at the toll free number above.